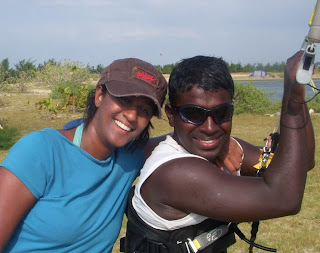 The first exposure or information I got about the sport of Kitesurfing was way back in 2006 when my friend Previne gave me a call asking if I wanted to attend a Kitesurfing Camp in Kalpitiya. I had the faintest of ideas what this sport was about nevertheless I said yes. I think they felt sorry, so I was given my first go in a powered kite. Just to fly it felt really nice. Marcel who later I got to know quite well, showed me how it was all done. Once that experience was over, I knew that I had to try the sport. Even before lessons, I ‘investment’ or shall I say borrowed money from my mum in order to buy my first 12M kite, Harness, Boards. If the camp was expensive, the gear was even more expensive! The plunge was taken and the next logical step was to be introduced to an instructor. I remember calling and meeting Mischi who drove down in the 4WD and talking to me. His first Lankan student I think. 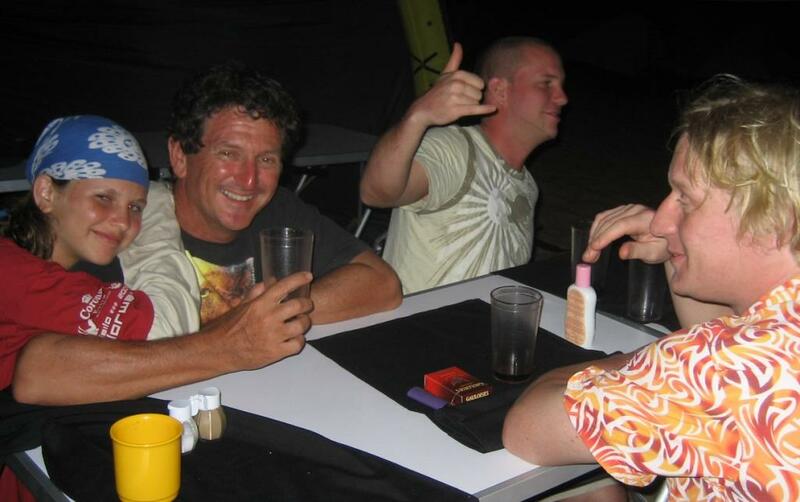 I remember his words of caution, ‘you must chose, a girlfriend or kitesurfing’, ‘this sport can ruin your life’. I did take it lightly, but in retrospect, whoa Mischi, it certainly is true! So the journey began, with lessons in Kalpiitya. A crazy little place far away from Colombo. All I knew about the place was that it was very volatile. The war in Sri Lanka was still on and Kalpitiya highly guarded. I remember the heat exhaustion due to pushing myself too hard for the sport and not drinking water, I remember the ambulance coming and giving me a jab on my bottom – I was too knocked out to even feel a thing! I remember puking all the way back to Colombo with Tassilo and Cora in the vehicle, I remember the long long bus journeys on the days I couldn’t get a ride to Kalpitiya. Wake up at 4.00 AM, carry your kite, boards etc to the top of the road and then hop bus 1 from Mount Lavinia to Fort Bus stand. The security check all the luggage (was still in the height of the war and bombs actually did go off in public transport). You thought Kitesurfing was a risky sport, try travelling in busses during the height of the war. I remember 3 distinct check points on the journey: Colombo, Near Chilaw, Kalpitiya. Each time everyone had to get off the bus which all gear, show it and then proceed. The journey to Kalpitiya took around 5 – 6 hours by bus then. 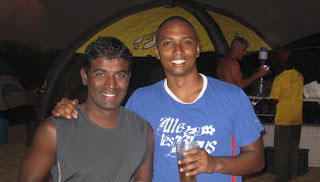 A savior was introduced to me one day in Kalpitiya, Julian Bolling, swimming great of Sri Lanka incidentally also was a fellow waterman like me and was into the sport of kiting. He has wheels, which was a luxury! One trip together and slowly we realize the common passions we had for a number of things. The journey’s became easier travelling by car, what a relief! 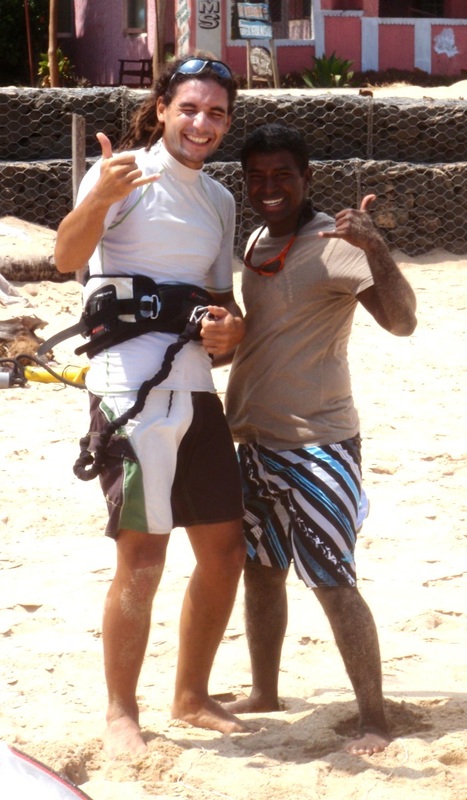 Julian was one of the first local kiters in Sri Lanka. Well, one of the first who attempted the sport. His busy schedule stopped him from really progressing fast. Now that I pestered him every weekend (yes, I didn’t want to take the bus!) he also got a chance to practice a lot thus improving! I soon became accustomed to Kalpitiya, I remember the lodging we had at Gabriels’ Lagoonside. Later on when I met Mike & Chunky we stayed at Harin’s bungalow. Those Rotties were awesome! My first big taste of downwinders was when Hannes asked me to join him in the ocean! To this day I love kiting in the ocean way more than flatwater! Thanks Hannes!!! Kitesurfing Sri Lanka was then started just with a view of putting Sri Lanka on the map for the sport. Initially we didn’t quite tell where all this kiting happened but later on the world started to hear about this awesome new spot we had in Sri Lanka. The first kite I flew was Faith and then Caution, I can’t remember when exactly but I was invited to be part of the Faith Team. It was a blessing. For an average person, kiting gear was expensive, being a rider enabled me to get discounts on gear, thus I slowly increased my quiver! Faith was instrumental in molding me into the kiting buff I am today. Thanks to the brand, I was exposed to the wonderful opportunities there are as a kiter. In 2011 I got my Instrutor License from the IKO and in January 2012 I went on for my first Kiting Competition! What a long way since the humble start taking the bus from Colombo. It was two years ago that Leo contacted me through my blog, I gave him all the information needed for the sport. He went on to run a kiteschool in Sri Lanka and in 2012 we joined hands to run Kitesurfing Lanka. With the background we have had. The experiences we got from the sport, the hardships, we understand your situation. We want your kiting experience to be a memorable one. We have experience the joys of kiting in this island paradise and certainly want you to have the same experience. This is what Kitesurfing Lanka is all about. The big downwinder with Hannes and Marcel where we ended at Dutch Bay. As soon as we landed the kites we see Indo Pacific Dolphins swimming just a few meters from the shore! The amazing kiting sessions Leo and I had in the South of Sri Lanka and also very recently in the new Dream Spot discovered by Leo and myself. The downwinder with Graham and Anny on the main lagoon. One year since I started writing this account, I sit in the ‘old camp’ with the ‘new camp’ in on the left of me. 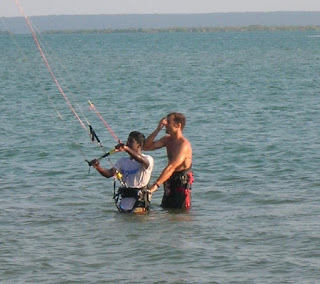 Wow, Kalpitiya is now on the map and Kitesurfing is here to stay in Sri Lanka. Join us in this amazing journey! The man who convinced me to try! Prev! Amazing people you meet. Franki was one of them.